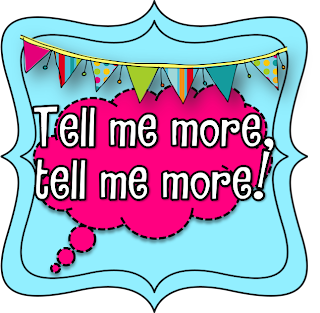 Amy Lemons over at StepIntoSecondGrade is having a Tell Me More Linky Party, as if you don't know enough about me already, lol. * I absolutely LOVE to cook and bake! I've been told that I'm pretty good at both. My favorite thing to make...anything that will make the people around me happy and full, no kidding! When I am cooking or baking, I like to pretend that I have my own cooking show, lol. I just keep it all in my head, unless I am alone. Picture me in my kitchen, talking to cameras that aren't there. Oh, and suddenly...I'm Southern. I think I was meant to be Southern. Throwin' around Hey Y'all's like I'm Ms. Deen. * I am seriously terrified of centipede's. Nothing that small should have that many legs and be able to move that fast. Ick, ick, ick. * I name my cars. Waaay back when I first started driving my parents gave me my Mom's old car. It was a Renault Alliance. She came with my Mom's plates...Jean608. She became the Jean Mobile. I also had a White Hyundai Accent, which was known as the Marshmallow. I went on to have a Toyota Corolla, he was Adam...that's right Adam Corolla. Now I have Rodge the Dodge Caravan. * I am a movie FREAK. I can't even narrow down my favorites. If I love it, I can watch it over and over and over. Some of my faves are Superbad, Almost Famous, Old School, Steel Magnolias, Shawshank Redemption....oh the list goes on and on! * I have 5 sisters, that's right 5. Three of them live nearby. Here is the most recent picture of us. I don't think I go more than a couple of days without Counting Crows. * I am in the process of rebuilding my life in every way you could possibly imagine. * You already know that I am a relatively new Mommy. My little Cooper was born on December 13, 2011. He is 7 months old and is my absolute EVERYTHING. I could not love him anymore. I would go to the ends of the Earth to protect that little guy. Got any name ideas for a Black Honda Fit? I love the idea of my car having a name, but inspiration has just not struck me yet...Haha! Oh, HAPPY BIRTHDAY!! Eat lots of cake. :) Nomnomnom! Happy birthday! You seem like such an amazing person. I love all of the things you post. Keep on keeping on, chickie! As far as being a mom goes, the days are long and the years are short! Enjoy every moment with little Cooper, he's darling! Happy Birthday!! Your boy is precious! You are a beautiful person inside and out. The love for your child shines through. Happy Birthday! Hope you took time to spoil yourself! Hsppy Birthday. I hope that you had a good day. Happy Birthday!! I know what you mean about the weight! I have always struggled with my eight... right now I am onmy personal journey to weight loss, heading to the gym 3-5 days a week and dieting. I am loving every bit of it... but I'm really excited about the results that I'll one day see. Happy Birthday! I have weight struggles...I always described myself as a skinny person in a fat body. However recently I have lost a lot (70 lbs), I still find it funny to look for things in a "skinny" size. HAPPY Birthday!! A little bit late. :) Hope you enjoyed it. Love, love, LOVE your blog. Did you have to put a nasty pic of a centipede on your post?!?!? LOL! I hate them! I often want to google them but did that a long time ago and got freaked out with all the pics...made me squirm! Happy Birthday Shannon! I understand what you mean about weight struggles. Even when I am thin I still feel as if I am not because I have struggled so much throughout my life. I also lost lots of weight while pregnant (both times) but the stresses of being a mommy to 2 kids helped me put it right back on. Now it is time to do something about it (again). Good luck and just remember this motto: even if you "fall off the wagon" while you are trying to lose weight, just pull yourself back up and start again. That's the beauty, there's nothing we can do that we can't UN-DO! Good luck! Hope you had a great Birthday! Cooper is adorable! I just nominated you for the Lovely Blog Award. Please come and check it out. Happy Birthday!! I am a new follower! Those are very cute car names! I personally like the name Marshmallow! Haha! Do you like marshmallows too? Well, I name my cars too, and my car’s name is Jasper!